I would highly recommend Noah to anybody! He helped me fix issues with my digestion, menstrual cycle, and skin. Issues that I had been told my whole life by various doctor's that there was very little I could do to help. He was the first to connect all of these things as related, and gave me a program to follow that helped immensely. My biggest concern was trying to conceive my second child. He identified what the problem was quickly, and gave me effective, natural remedies to fix the issue. I had been un-successful on my own for six months, and within 3 months of Dr. Edvalson treating me, we conceived. I have had a healthier pregnancy this time, and I know it is due largely to what Noah did to help before conception ever occurred. My husband and I will be forever grateful for his knowledge, compassion, and concern for us. He truly is passionate about what he does, and you can see it in his work. I would highly recommend Dr. Noah Edvalson for your Chiropractic care. For as long as I have known Doc Noah I have always found him to be a professional with the highest level of integrity. I find great confidence in being able to refer to Boise Integrated Chiropractic anytime someone I insure is suffering from the pain caused by an auto accident. Doctor Noah Edvalson genuinely cares about his patients' overall health. He takes the time to listen to all of their concerns and focuses on finding the cause of their ailment rather than just treating their symptoms. I would highly recommend Dr. Edvalson to anyone suffering anything from persistent heartburn to chronic pain. After seeing a different chiropractor for a year, my progress had plateaued and I was beginning to feel worse instead of better. I was referred to Dr. Edvalson and it was the best decision I could have made for my health. I love the personalized treatment I get and the friendly, courteous staff. I now feel better than ever and would refer anyone and everyone to him. I've seen a number of chiropractors over the years. My experience with Dr. Noah was unlike any other chiropractic experience. He took time asking questions to understand exactly what was bothering me, and asked about not just the pain I was experiencing but about what my average day consisted of. Which might seem a little strange but it helped him determine what kind of things I could do to prevent re-aggravating my back. I noticed a significant improvement after my very 1st visit. 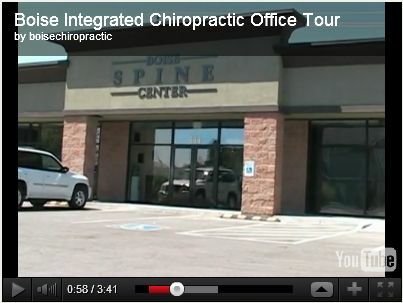 I would recommend anyone who has chronic back pain to stop by Boise Integrated Chiropractic, and see Dr. Noah. What do you look for in a Chiropractic Dr? If you are like me; you are looking for one that doesn't "Rack em' and crack em'!" In getting to know Dr. "Noah" in a BNI business group the past year I have come to appreciate his integrity and sincere interest in helping me and everyone learning how and what to do to be healthy. If you are looking for a personable Dr. that listens and KNOWS much of what you will need to restore your health; you found the right person. I visited Dr. Edvalson after a snowboarding accident left me with a nagging pain in my left thumb. After a minor adjustment and brief massaging my thumb felt as good as new. He also made some nutritional recommendations that were right on the money. I was able to return to normal athletic activities without any further pain. His competence and compassion were impressive, to say the least, and will keep me returning to him for top-notch holistic care. Dr. Edvalson is a talented and compassionate physician with a wealth of knowledge in holistic medicine. He looks at the whole person when treating an individual. He is not simply a muscle and joint doctor, he is an integrated physician and a great doc!